We got a whopping two-tenths of an inch of rain last week. It was glorious while it lasted. Unfortunately, it mostly drove the humidity up and the ground continues to bake. Temperatures have been holding steady in the mid-90s for more than 25 days now, often pushing into the triple digits. The tulip poplars are shedding their leaves so fast it looks like fall. We’ve started feeding hay to the weaned calves. We’ll be lucky to make it through July before the rest of the herd will need hay. We were able to cut and buy in our usual amount of round bales, but we usually don’t start feeding it until December. At this rate, we don’t have enough to get us through winter and it’s unlikely we’ll be able to find anymore as everyone is in the same boat. Yesterday I heard on NPR that 61 percent of the country is experiencing drought. I hope this weather isn’t our new normal. The drought and the heat is taking its toll everywhere on the farm. Julia’s milk production is typical for what I would see during winter. I’ve taken to letting Babette take all the evening milk. The hummingbirds are going through one feeder full of nectar a day. The wild birds that come to our feeders have been grateful for the seed and water that we put out for them. We lost a chicken during the last heat spike and if the promised forecast holds true this week, we could lose more. 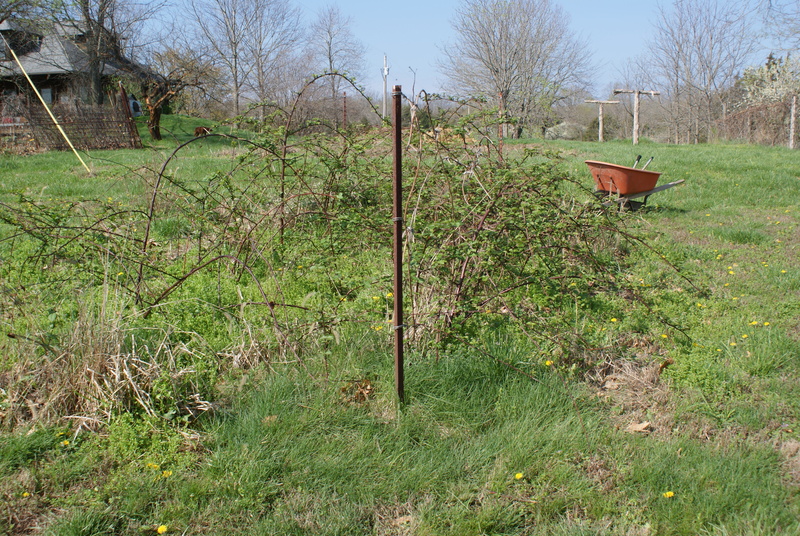 The garden looks like hell. The corn is burnt crisp. The squash produced so poorly, I finally quit watering them. The tomatoes are covered in green fruits – all with blossom end rot. Same for the peppers. Me? I managed to come down with a nasty cold that kept me from training for four days. Not a good start to my training plan. I did pull off a 750-yard swim on Wednesday and a three-mile run last night. I waited until 8 p.m. so things could “cool” down. Wow. Not much good news to report here. I checked the 10-day forecast this morning and it promises more of the same. Some days, the idea of living in a condo in town seems like a wonderful idea – a life where extreme heat and dry days would feel like an irritating inconvenience, not something to fear. 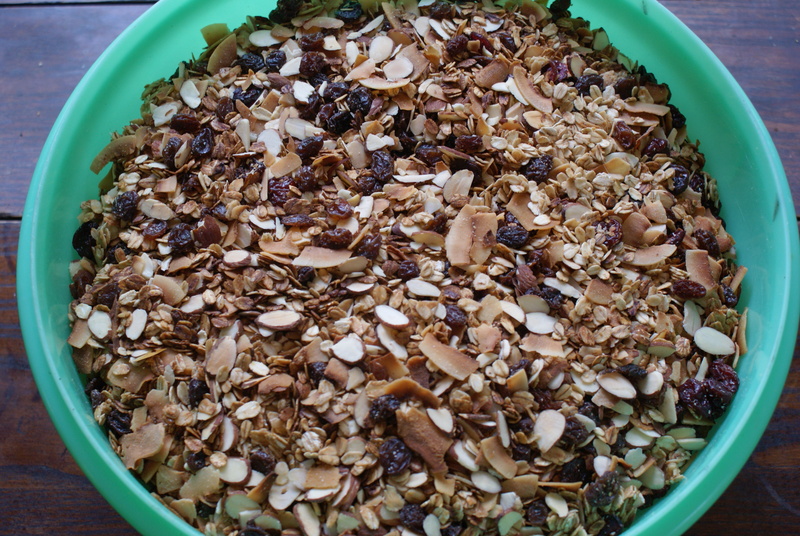 This time last year I started making homemade granola. Ever since, I’ve made sure to keep a batch on hand. I like it as a cereal swimming in Julia’s milk. 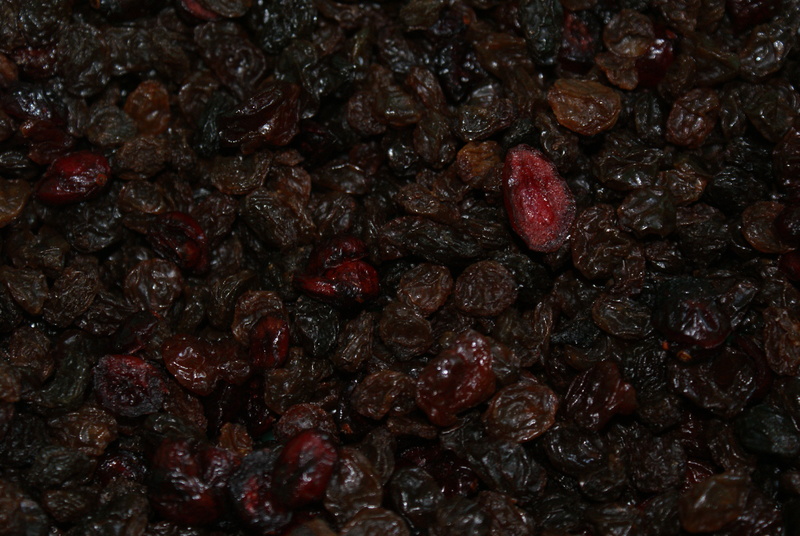 It’s also good on ice cream or yogurt. This week, though, I let us run out and we’ve been without for several days now due to the fact that I haven’t wanted to turn on the oven. Yesterday I sucked it up, turned the oven to 350 degrees, and whipped up several weeks’ worth of breakfast. It’s so good I gave bags of it away as Christmas presents last year. Preheat the oven to 350 degrees (you can make it hotter, if you like, but don’t leave the room even for a minute as you’re toasting your ingredients. Ask me how I know this). Spread the coconut onto a cookie sheet so it’s in a single layer. Keep an eye on it as it will burn soon after it browns. 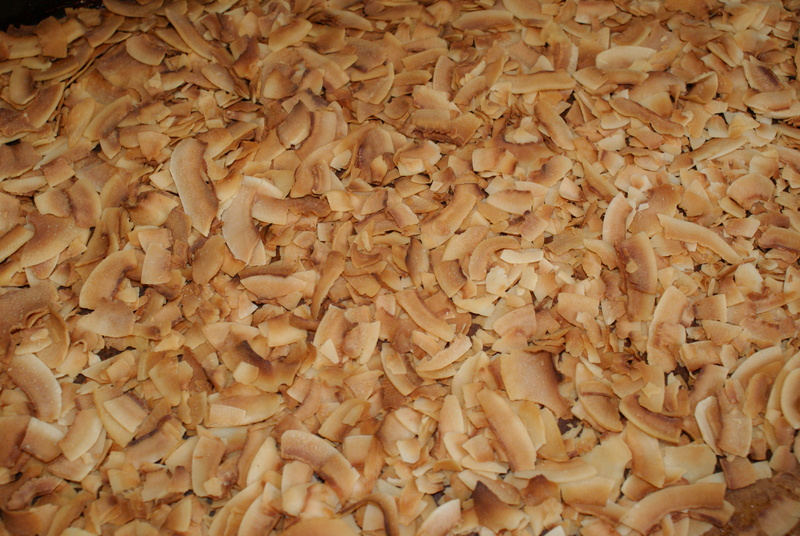 When you can smell the scent of coconut, it’s ready to come out. Let cool and add to a big container with a tightly fitting lid. 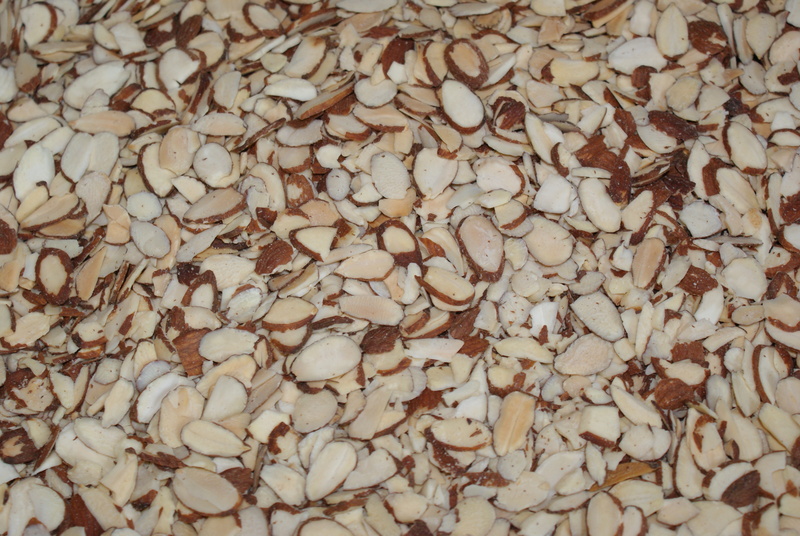 Toast the slivered almonds the same way. Cool and add to the coconut. In a small saucepan combine the oil, honey, cinnamon, salt, and vanilla. Heat until the honey is nice and liquid. Pour the mixture over the thick, rolled oats. 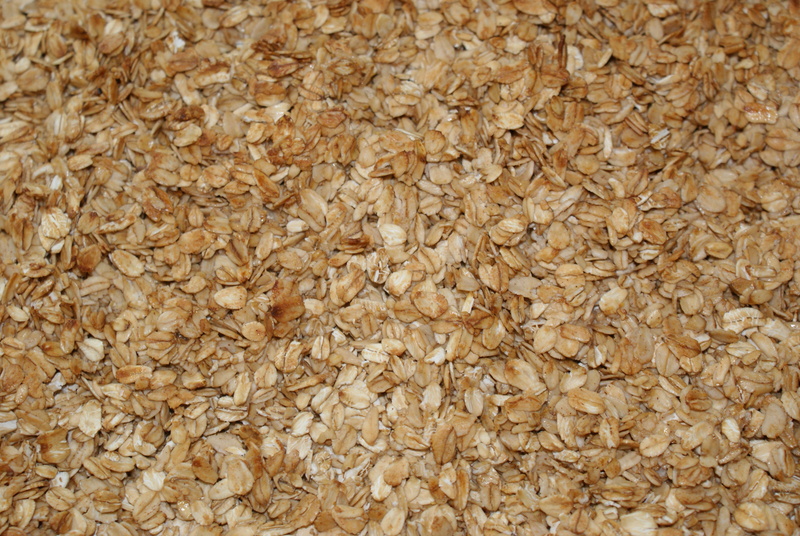 Spread that mixture onto two separate cookie sheets and toast until the oats are a golden brown. Cool and add to the container. Cover with a tightly fitting lid. Enjoy a homemade breakfast for weeks. Things here are bone brittle dry. 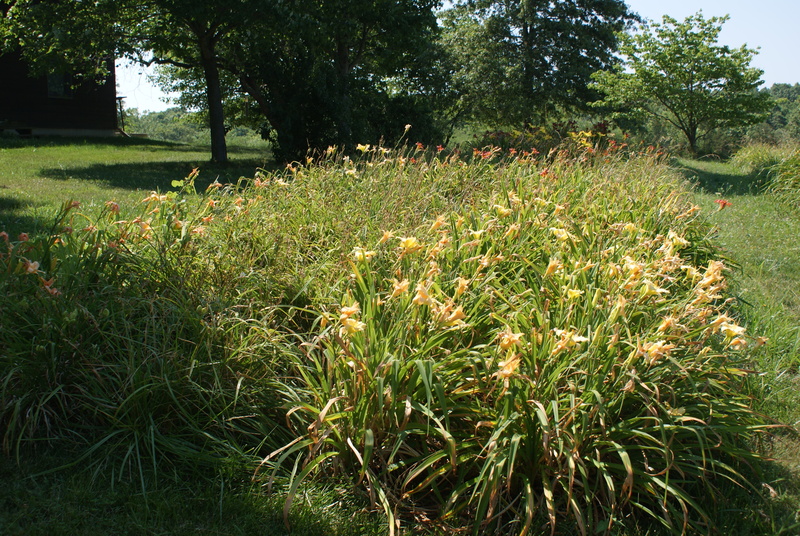 I walked the pastures on Tuesday through baked brown grasses where all I heard was crunch, crunch, crunch under my feet. Thankfully, folks in our neighborhood honored the holiday quietly and didn’t spark any wildfires. We were on tap to host a family reunion, but our house is too small to entertain a large group inside and at 104 degrees it was too hot to ask everyone to stay outside. So, the event has been postponed. Instead, we headed into town for dinner and then we parked our lawn chairs in a local cemetery for a great view of the fireworks. The bank thermometer read 91 at 9 p.m., but it was surprisingly comfortable. To gussy things up for the Fourth, I made this sign. Fourth of July Pinterest project. It’s what happens when you noodle around on Pinterest and then make a shopping list for the hardware store. It came out nicely, I think. In other news … I’ve signed up for Club Nationals, a triathlon event on Sept. 23 for triathlon clubs around the country. I’ll be representing Columbia Multisport Club along with 100 or so other CMC members. It sounds like a lot of fun. We had an informational meeting on Monday, and I started my training plan on Tuesday when I did a 1/2 mile pool swim and later in the evening ran hill repeats with an Ultramax training group. This morning I hoped to meet up with Joe Company of Endurance Company who’s written the CMC Nationals Training Plan, but in my hurry to get there on time I misread where we were meeting. So, I ended up running solo through the streets of downtown Columbia. It was a pretty nice place to be at 6 a.m. And I found a $10 bill on the sidewalk to boot! I used it to buy a nice latte from Coffee Zone. All in all, not a bad way to spend a summer morning. 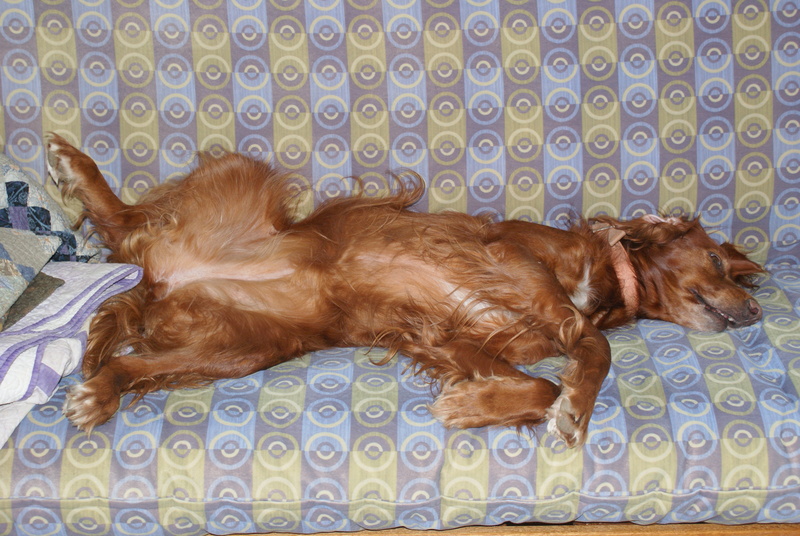 Ruby estivating on the couch. (of an animal, particularly an insect, fish, or amphibian) spend a hot or dry period in a prolonged state of torpor or dormancy. Most days I feel as if I haven’t gotten much done. I seem to pick away at things here and there, and it’s hard to step back sometimes and see the bigger picture. Things are happening – even on 100-degree days. 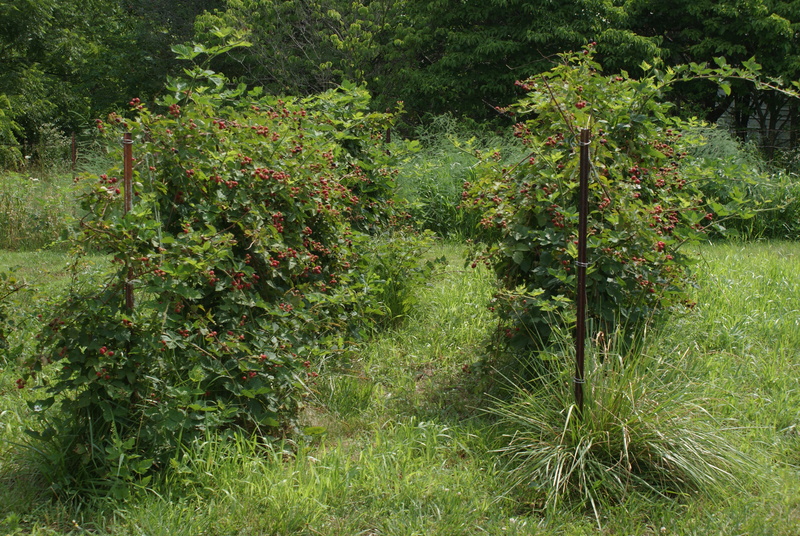 The blackberries we pruned and retied this spring are producing like gangbusters. 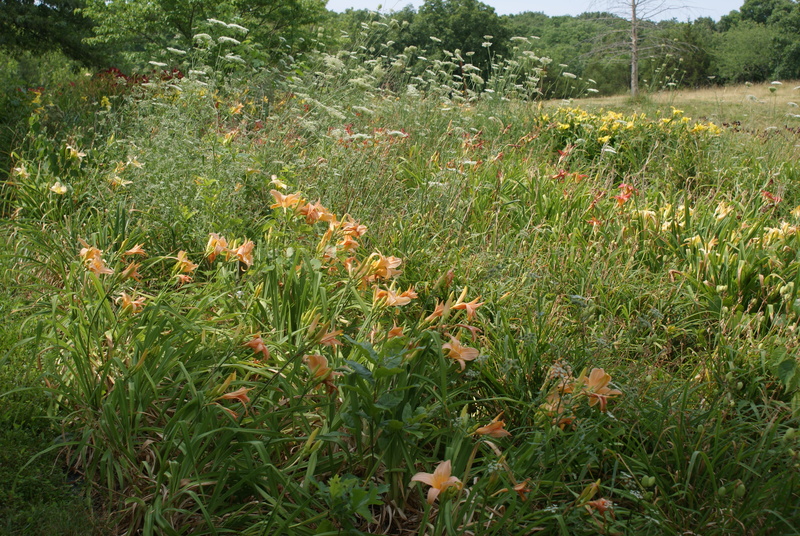 The daylilies I weeded are suffering in the heat, but at least the beds look a bit tidier. We don’t get out much. Living with milk cows bookends a farmer’s day very neatly, so things like dinner and a movie can become out of the question. However, we now have two relief milkers, one of whom came out Saturday night to milk so we could do dinner and a movie. We chose Bernie. 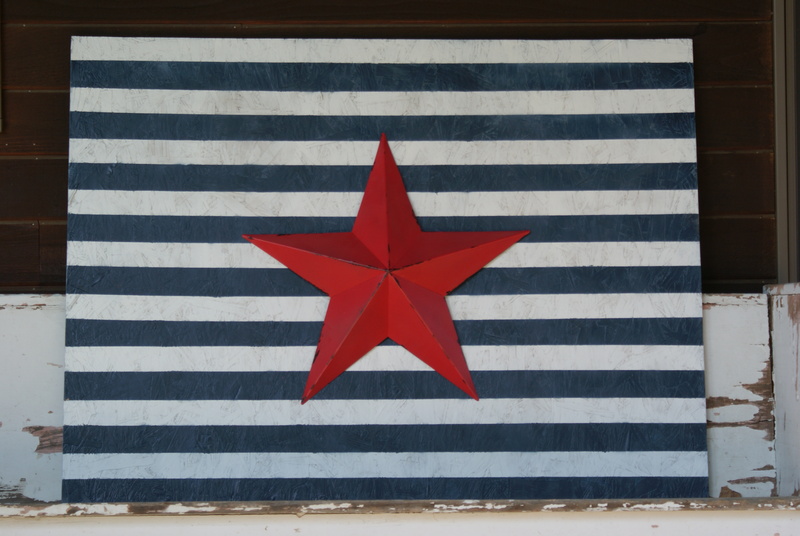 It’s a true Texan story about an assistant funeral director named Bernie. At times I laughed so hard I had to take my glasses off and dry my eyes. I will say no more and let the movie speak for itself. If you only see one movie this year, make it Bernie. I’m becoming craftier as I age. No, not more cunning, more of a longing to work with needles and thread. 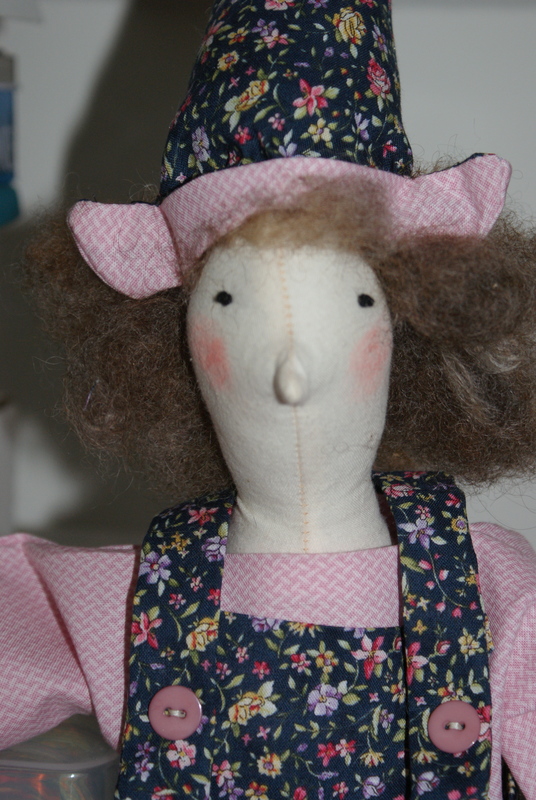 In March I made my first foray into doll making. Believe me, no one is more surprised by this development than I am. I got Tone Finnanger’s Crafting Springtime Gifts from our local library and a friend and I got together to make rabbits. 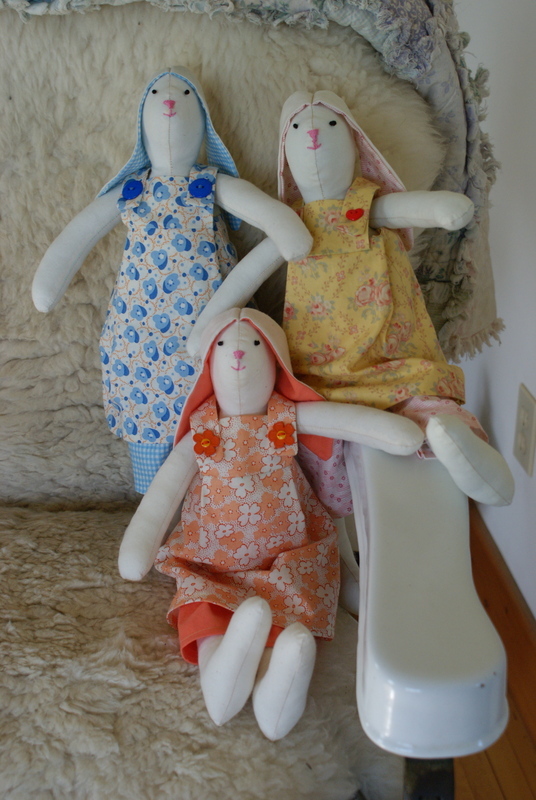 I made a trio that were delivered on Easter as gifts for my mother and my two nieces. These three girls were Easter presents. I’m lucky that I have friends who share a willingness to try new things – branch out a bit from their more familiar arts. Last week we got together for another round of doll making. This time we made witches. I only made one, but I’m pleased with how she came out. Her wild mohair/merino hairdo is especially nice. 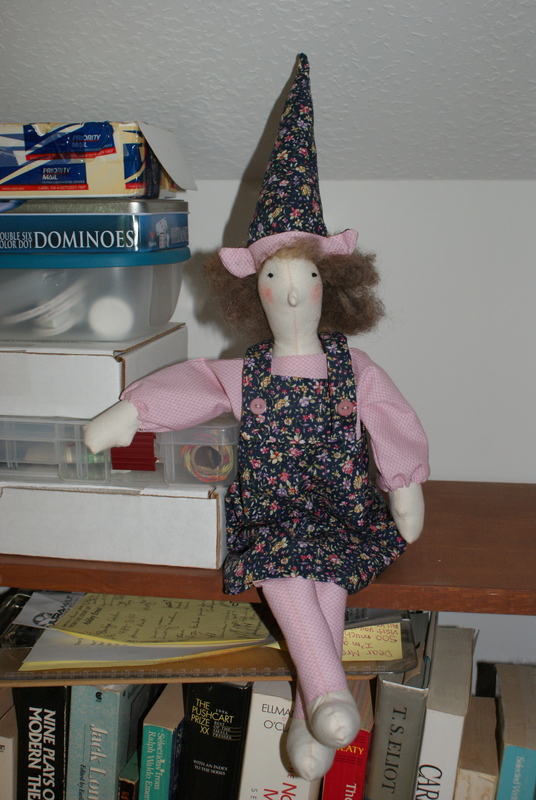 Newly finished witch sitting comfortably on a crafting shelf. 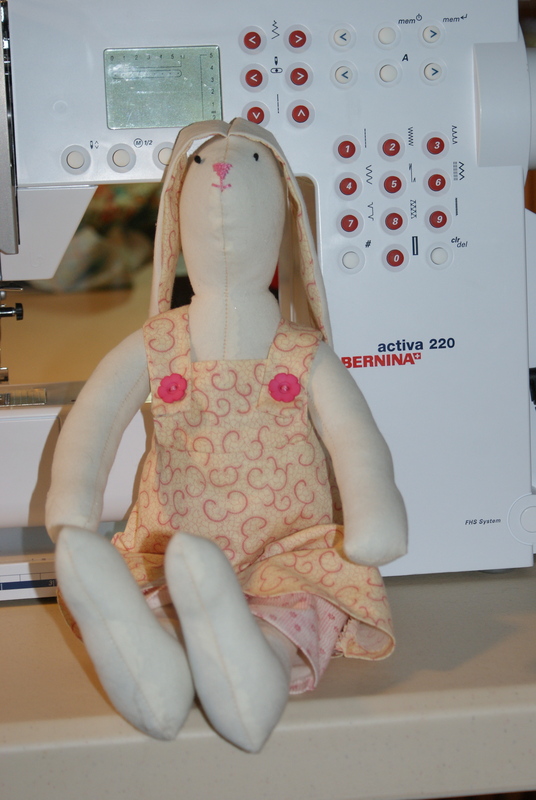 One of my goals this summer is to finish many of my unfinished projects, so I was also happy to put the finishing touches on the rabbit doll I’d made for myself. Since March she’d been sitting with her unattached arms sitting rather forlornly in her lap. Not any more. Temperatures next week are supposed to top out near 100 degrees. I see more crafting in my future.